Manufacturing jobs in USA had its glory days during the 1970s when it peaked at 19.4 million (Figure 1). At that time about one in five American workers had a job in manufacturing. For the next two decades, it was fluctuating around 17.5 million. The free fall happened at the beginning of this millennium from 17.3 million in 2001 to the lowest of 11.5 million in 2010. The mild recession in 2001 and the Great Recession during Dec 2007 to June 2009 accelerated this fall. In the last six years, manufacturing sector just added 800,000 jobs out of the 5.8 million jobs vanished in the first decade of this millennium. Now only one in thirteen American workers has a job in the manufacturing sector. What happened to those experienced and skilled employees? Some of them were moved to low-paying jobs in other industries, some resorted to part-time work, and the remaining just frustrated out of the job market unsuccessfully trying to change their skill sets. The federal and state governments provide many great services for the unemployed including help with job searching, career counseling, and job training. The effectiveness of these training programs, in helping the unemployed to transition to a new job and boosting the local economy with respect to opportunities available, need to be evaluated. The orientation of American economy has transitioned primarily from agriculture (early 1800s) to manufacturing (late 1800s) to service (1980s) sectors. Figure 2 shows the decline in manufacturing sector’s contribution to U.S. GDP and the corresponding increase in service sectors. It decreased from 22.9% in 1970 to 12.1% in 2015 for manufacturing. During the same period, service sector’s (Finance, insurance, real estate, rental, and leasing / Professional and business services / Educational services, health care and social assistance) contribution increased from 23% to 41%. According to Bureau of Labor Statistics projections, job growth is expected to be the highest for health care and social assistance sector in the next decade and it will have the highest number of jobs among the entire service sectors by 2022. 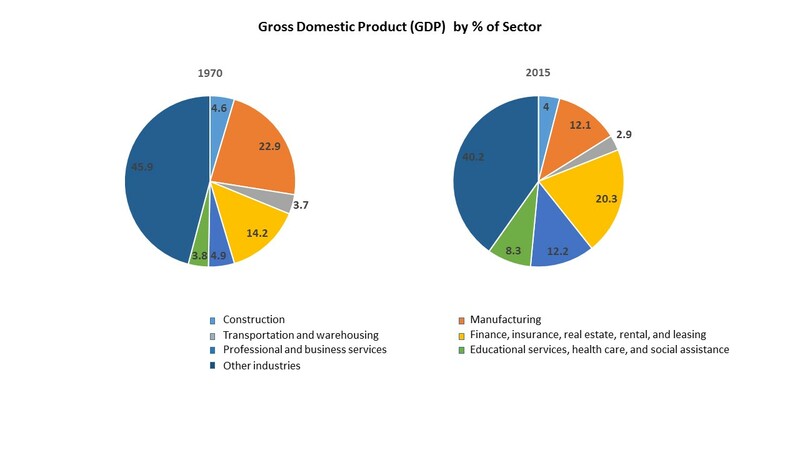 Source: Bureau of Economic Analysis, “Gross Domestic Product (GDP) by Industry Data”, http://www.bea.gov/industry/gdpbyind_data.htm. Why manufacturing jobs are important for U.S. economy? Manufacturing sector is the backbone of any major economy. A county cannot sustain solely based on service sectors. Manufacturing companies drive innovation through their research and development that in turn result in better products and better standard of living. 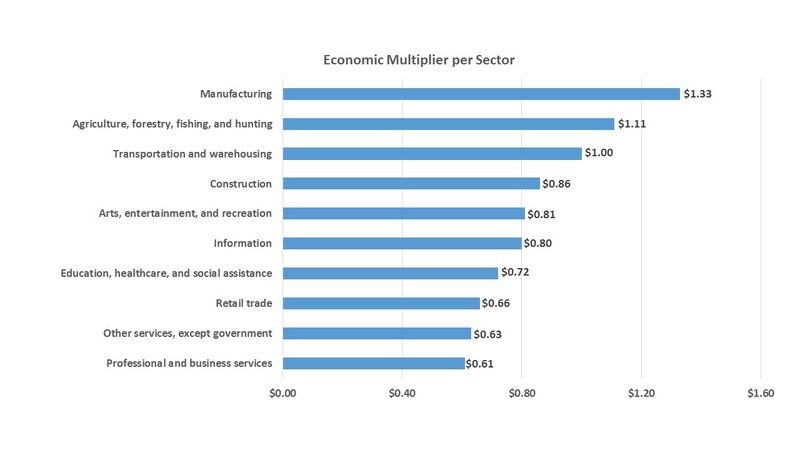 As shown in figure 3, economic multiplier is the highest for the manufacturing sector ($1.33). It means that each dollar in final sales of manufacturing supports $1.33 in output from other sectors. 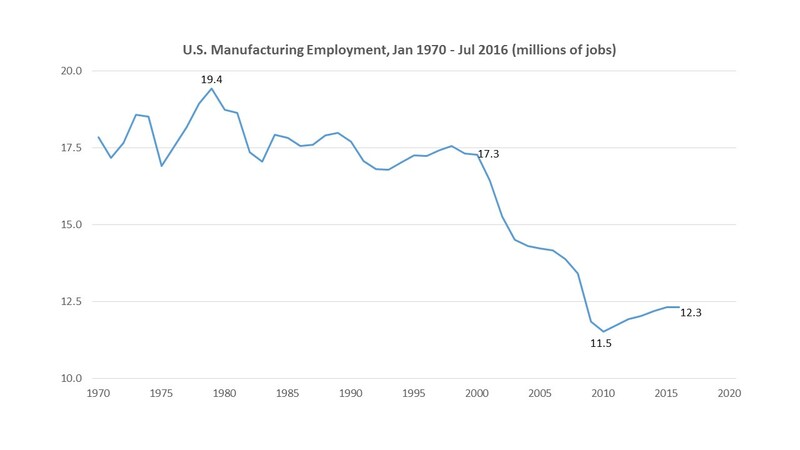 This indicates the positive ripple effects that manufacturing jobs make in our economy. Economic multiplier is the lowest for service sectors. Source: Manufacturing Institute, “Manufacturing’s Multiplier Effect is Stronger that Other Sectors’”, http://www.themanufacturinginstitute.org/Research/Facts-About-Manufacturing/Economy-and-Jobs/Multiplier/Multiplier.aspx. Boosting the Manufacturing sector in U.S.
Two suggestions for boosting manufacturing sector are fixing the U.S. corporate tax system and improving the environmental protection policies (DiMicco, 2015). USA has the highest corporate tax rate (39.1 percent) among industrialized nations. In his book, “American Made: Why Making Things will Return Us to Greatness”, Dan DiMicco argues that the ideal corporate tax rate should be 23 percent. It will greatly encourage companies to keep the base and significant presence here in U.S. soil. The environmental regulations are very stringent in United States compared to other countries and may put a drag on the expansion of manufacturing sector. The increasing compliance costs for these regulations will discourage existing and aspiring companies as it is not practical to pass these costs to customers. The impact can be summarized as follows: The air may be microscopically cleaner, but only because nobody’s working (DiMicco, 2015). Following are the two major initiatives under Obama administration that support the manufacturing sector. Formation of Manufacturing USA – the National Network for Manufacturing Innovation (NNMI). Through Manufacturing USA, industry, academia, and government partners collaborate and leverage existing resources to establish manufacturing institutes each with a distinct technology focus area. The goal is to secure America’s future through manufacturing innovation, education, and collaboration (Manufacturing.Gov, 2016). Federal government is also working on getting the Trans-Pacific Partnership (TPP) ratified. TPP is a trade agreement among 12 countries (Australia, Brunei, Canada, Chile, Japan, Malaysia, Mexico, New Zealand, Peru, Singapore, USA, and Vietnam) to reduce trade barriers. TPP will eliminate and reduce import taxes–or tariffs-on the American exports to TPP countries and will significantly boost the U.S manufacturing sector (USTR.GOV, 2016). DiMicco, D. (2015). American Made: Why Making Things Will Return Us to Greatness. PALGRAVE MACMILLAN TRADE. Agile has been evolving as the most sought after methodology for Information Technology projects and software product development. With all buzz around agile, organizations that were reluctant earlier on its adoption are now seriously considering to try out some flavor of it. This article explores the evolution of Agile since its humble beginnings in the 1980s and the key differences between Scrum and Kanban, the two most popular Agile approaches. 1984 – Barry Boehm published an empirical study about projects that use prototyping. He pointed out the increasing popularity in the iterative approach. At this point, Agile was meant to have two iterations in a project. The first iteration creates the prototype and the second iteration develops actual product based on feedback received from prototype validation. 1984 – In their paper ‘Knowledge-based communication processes in software engineering’, Gerhard Fischer and Matthias Schneider mentions about incremental design processes based on Rapid Prototyping approach as complete and stable specifications are not available at the beginning of development. 1985 – Tom Gilb published the paper ‘Evolutionary Delivery versus the “waterfall model”’ in which waterfall methodology was criticized as unrealistic and dangerous to the primary objectives of any software project. He introduced Evolutionary Delivery model as an incremental alternative to the traditional approach. 1986: In his paper ‘A Spiral model of software development and enhancement’, Barry Boehm presented an iterative model geared to identifying and reducing risks through prototyping, benchmarking, simulation, reference checking, analytic modeling, or combinations of these and other risk resolution techniques. 1988 – Scott Schultz and James Martin refined the ideas of prototyping and iterative development into a methodology called Rapid Iterative Production Prototyping (RIPP). It focused on the use of ‘timeboxed’ iterations for software development by small and motivated teams. 1991 – James Martin further expanded and formalized RIPP and published the book Rapid Application Development (RAD). It focused on faster development of higher-quality products through more expedient processes such as early prototyping, reusing software components, and less formality in team communications. 1992 – The Crystal family of methodologies was initiated by Alistair Cockburn (it was officially named Crystal in 1997). It comprised of the agile methodologies such as Crystal Clear, Crystal Yellow, Crystal Orange, and others whose characteristics are driven by team size, system criticality, project priorities, etc. It addresses the fact that each project requires a customized set of policies, practices, and processes to meet the unique characteristics of a project. 1994 – Dynamic System Development Method (DSDM) was jointly developed and promoted by the members of DSDM Consortium. It is an Agile framework created out of the need for an industry-standard RAD framework. 1995 – Ken Schwaber and Jeff Sutherland published the paper ‘SCRUM Software Development Process’ that assumed systems development process as unpredictable and complicated and suggested cross-functional and self-organizing teams to develop product increments. Scrum uses the empirical inspect and adapt feedback loops to cope with complexity and risk. 1996 – Extreme Programming (XP) was formulated by Kent Beck. It is renowned for the practices such as pair programming and test driven development. XP empowers the developers to confidently respond to changing customer requirements, even late in the software development lifecycle thus achieving higher levels of customer satisfaction. It promotes high customer involvement, continuous planning, continuous testing, rapid feedback loops, and close teamwork to deliver working software at very frequent intervals. 1997 – Feature Driven Development (FDD) was introduced by Jeff De Luca and Peter Coad. It consists of two main stages: discovering the list of features and then the feature-by-feature implementation. FDD has more formal requirements and steps than XP. 1997 – Adaptive Software Development (ASD) was derived from FDD by Jim Highsmith and Sam Bayer. It consists of a repeating series of speculate, collaborate, and learn cycles that are feature-based, iterative, timeboxed, and risk-driven and facilitates continuous learning and adaptation. 2001 – Representatives from the non-waterfall light processes met together in Utah. They established the term ‘Agile’ for those light processes and developed Agile Manifesto that focuses on a common set of principles. Agile Alliance was incorporated. 2005 – David Anderson experimented with a visual board called the Virtual Kanban System for Software Engineering for a project at Microsoft. Kanban is a form of lean software development approach. The project team uses Work-In-Progress (WIP) limit to the number of items they work at any point in time and ‘pull’ the next work item accordingly. 2009 – Two entities for exploring the Kanban approach were formed, one addressing business concerns, the Lean Systems Society (LSS) and the other aimed at giving the community more visibility, the Limited WIP Society. 2012 – Dean Leffingwell published the first version of Scaled Agile Framework (SaFe) that combines Agile approaches with more enterprise-centric organizational practices to scale Agile to the enterprise-level. 2013 – Craig Larman and Bas Vodde introduced Large-scale Scrum (LeSS) framework for inspecting and adapting the product and process when there are many teams – at least two teams and up to groups of 500 or 1000 people. It exposes weaknesses in organizational design with respect to structure, processes, rewards, people, and tasks and supports organizational change to facilitate an effective Agile transformation. According to a survey (Fig 1) on product methodology adoption rates conducted by Actuation Consulting in November 2014, only 10% of organizations are using the traditional Waterfall methodology for software product development. About 45% of the organizations are using some form of Agile methodology with Scrum (33%) as the leading choice followed by Kanban (3%). The remaining 45% use a cautious and experimental, blended approach by choosing Agile for some of the projects and Waterfall for others. This survey indicates the acceptance of Agile methodology for software product development and the trend favoring Scrum and Kanban approaches. Scrum has garnered increasing popularity in the agile software development community due to its simplicity, proven productivity, and ability to act as a wrapper for various engineering practices promoted by other agile methodologies (McLaughlin, 2015). But, it may not be a one-stop solution towards agility. Due to the organizational culture or the nature of the project, there can be scenarios in which Scrum may not work effectively. In those situations, teams have started opting for Kanban that is less prescriptive and more adaptive in nature. Kanban got only two constraints: Visualize Your Workflow and Limit Your WIP; everything else is up to the team to get adapted to. Following are the major differences between Scrum and Kanban. Organizations are realizing that adoption of Agile processes may not be as easy as it sounds and requires significant organizational culture and process changes and sustained management commitment to gain most out of it. Inspect and adapt nature of Agile methodology can be utilized by teams to experiment and choose an approach (XP, Scrum, Kanban, etc.) that works best for them. Teams can do trial and error on the prescriptive and adaptive processes of an Agile approach and choose the ones that work best for them. The Agile adoption trends towards incorporating the processes from multiple Agile approaches that enable the teams and organizations to be more productive. It will be interesting to see the continuous evolution of Agile practices that facilitate more effective and sustainable enterprise-wide Agile transformation. Kniberg, H., & Skarin, M. (2009). Kanban and Scrum – Making the most of both. InfoQ. As per US Department of Labor statistics, about 30% of the start-up businesses fail within two years and 50% within five years. The longer it takes for failure, the higher will be the product development costs that get wasted. Instead of ‘doing everything you can make it to succeed’, the angel investors and venture capitalists now demand ‘failing fast’ within the first one or two years in order to reduce the overall risk of their investment portfolio. According to Eric Ries, the author of ‘Lean Startup’, technology risk – the risk that the company cannot develop what it is intended to build- is no more an issue. Instead, market risk – the risk of users who do not really want the product – is the factor that decides the fate of a product. He promotes a series of experiments that can be done quickly and inexpensively to gauge customer reactions to new product ideas or features. These experiments can be as simple as customer interviews at a local shopping mall or demonstrating a Minimum Viable Product (MVP) to customers. Companies can save many millions of dollars by adopting a ‘failing fast’ strategy for a brand new product or a new product feature much before it gets to the production stage. For software product development, Agile methodology supports the implementation of failing fast strategy. The cross-functional and self-organizing teams can develop the most valued features of a product at small increments and test it immediately with customers. The feedback received can be utilized to make improvements to the product or the product idea itself can be abandoned without incurring any additional cost. The travel retailer lastminute.com took this strategy to a new level by moving their development team to the lobby of Cumberland Hotel in London. It allowed the team to show prototypes to travelers directly and getting feedback on risky or raw product concepts (Computer Weekly, 2013). According to Bill Beckler, director of innovation at lastminute.com, their goal is to fail fast rather than letting bad ideas occupy the team’s product backlog. This approach enabled them to demonstrate many ideas directly to the customers and then make additional investment decisions only if that idea created or added value to customers. At Microsoft it used to take a longer time for a defect fix to reach customers due to its extensive development and testing cycles. After realizing that failure is cheap, most new products like Azure and Office 365 have monthly release cycles that incorporates changes demanded by customers. This makes sense for every product development especially considering the faster pace at which technology and consumer tastes change. For an organization, failing fast strategy should enable it to create a company culture based on iterations and continuous improvement. High risk taking and the associated success or failure should be equally rewarded to create an entrepreneurial and friendly environment. This will promote innovation, improve time to market, and reduce development costs. It will only be a failure if organizations fail to learn from its failures. In this month (September, 2014) I have reached a major milestone in my professional life. After being with my current employer for 14 years I made the decision to accept a new job offer. It is going to be a big transition from the comfort zone of the current job to the new uncertain challenges. As I prepare this writing all those memories since the early years in USA started pouring in my mind. Those initial four years in Louisville, Kentucky, learning and adapting to the life in USA, the six months of transit in Troy, Michigan, and then the long ten years in Bloomington, Illinois; life was eventful in the past 14 years. Arrived in USA in 2000, the first year was spent in exploring and verifying whether all those facts and hypes about US was real or not. In the first interaction, my client manager queried whether I am single or married. After conveying my single status, the next question was ‘do you have kids?’. This was an initial experience of the culture shock. Due to the conservative background, such a follow-up question would not generally be asked in India especially if you are single. There were lots of firsts for me in that year; the first car, the first mobile phone, driving the first U-Haul, the first snow, and so on. The Information Technology (IT) department at the Louisville client was very small. Each team member had to perform multiple roles such as of a designer, developer, tester, and trainer in the software application development projects. Even though the concept and terms of Agile/Scrum was not widely known at that time, later I realized that it was one of the best collaborative environments I have involved with. The average duration of an IT project was much shorter although the quality of the final product got compromised at times. The short stint at Troy as an offsite team member for the next client polished the qualities of integrity, responsibility, and timeliness as the client is not directly watching you. The only limitation I found at that time was the lack of instant access to onsite resources. After moving to onsite at the client site in Bloomington, I began to be a part of role-specific assignments. In this highly organized environment, each IT role has its own tasks and you are authorized or expected to perform those tasks only. You can become an expert in that specific job function. It provides the avenue for sharpening specific job skills and helps improve the overall product quality; but negatively affects the average duration of projects. The Agile methodology worked extremely well in certain stand-alone projects to improve productivity and to achieve faster time-to-market; but could not be effectively applied in larger enterprise-wide initiatives. Achieving the right balance of project duration and the product quality should be of upmost importance to the IT departments to make sure that the product is delivered faster than the competitors and the most current needs of the customers are fulfilled. I leave my company and the client with much gratitude and appreciation for the opportunities and the stability it has provided over the years. Thanks to my loving family, wonderful friends and amazing colleagues for your support and encouragement. Best wishes for a better tomorrow and always hope for the best! Note: The opinions expressed in this post are solely of mine and do not represent the opinions of my employer. Is Internet connectivity a human right? In his article Is Connectivity a Human Right?, Mark Zuckerberg, the founder of Facebook, points out the significance of the global knowledge economy and how the access to the Internet can contribute and enhance the global collaboration and productivity. In order to achieve this, he promotes Internet connectivity as a human right. Even though the vast majority of the world population lacks the Internet connection, it may not be right to term it as a human right. Instead, I prefer to see it as a medium for each country to empower its citizens and utilize the Internet’s possibilities to achieve economic prosperity. The infrastructure gets expanded progressively by the market-savvy and profit-seeking Internet applications and telecommunications companies. It is up to the political leaders of each country to take the bold policy initiatives to ensure seamless and unfiltered internet connectivity to shape its economic future. Following are the three major challenges in providing the internet connectivity to all. First, building a cost effective infrastructure is the biggest one. Wireless technologies seem to be promising in covering the remote areas of the world effectively. In addition to the efforts by Facebook as listed in this article, Google has recently initiated an effort to build and run wireless networks to help connect a billion or more people to the internet. Second, each customer segment should be studied thoroughly and offered the internet applications that will directly help them to improve their daily lives. For farmers, weather related information and pricing updates for their goods are of more importance than access to a social media site. Third, obtaining the political will of a country’s leaders is a significant challenge especially considering the corruption in government establishments in the developing and third-world countries. They may be afraid that empowering the common people would affect their existence. Internet has proven itself as a great medium to invoke entrepreneurship spirit and to enable the timely communication of key information. As the acceptance and utilization of Internet’s infinite possibilities increase, it in turn accelerates the economic growth of a country. The Internet connectivity need not be considered a human right, but its enormous benefits, if properly leveraged, can enhance the lives of people. If the political leadership of each country can realize this aspect and formulates a vision for the cost effective internet connectivity, the world will definitely be a better place. Fidelman, M. Why Mobile is Critical to Developing Nations. Retrieved August 30, 2014 from http://www.forbes.com. Worstall, T. Google’s excellent plan to bring wireless internet to developing countries. Retrieved August 30, 2014 from http://www.forbes.com.. Imagine yourself in the year 2020 shopping around to change the auto insurance provider. You will come across Usage Based Insurance (UBI) quotes where a basic premium need to be paid every month for the liability coverage. The additional premium amount will be calculated based on the number of miles you drive, the location you drive, and how efficiently you drive. All this customer information is transferred automatically from your car to the insurance company and the final premium will be calculated based on your average risk profile value for the month. Are you seeing a similarity with the utility bill calculation that is based on the usage? Yes, Insurance industry will undergo a major transformation in the coming decade in its approach on assessing the risk profile. There will be more usage based offerings that fit the need of the modern customer. This will be made possible by the technological advancements and the efficient utilization of Big Data. Big Data is not a technology, but rather a phenomenon resulting from the vast amount of raw information generated across society, and collected by commercial and government organizations (TechAmerica Foundation, 2013). The four basic characteristics of Big Data are the volume (data at rest), velocity (data in motion), variety (data in many formats), and veracity (data quality). Volume refers to the large quantity of data that must be analyzed and managed to make decisions. Velocity is the speed at which data is produced, changed and processed. The Variety attribute refers to the structured, semi-structured, and unstructured data that comes from within and outside of the organization. The Veracity points to the quality of received data. Insurance companies have been processing the structured data for many decades and it helps them to better serve the customers with innovative products and services. In the insurance industry, volume indicates the large amount of transactions that occurs every day from quotes, policy, claims, and payments. The velocity aspect provides the ability to calculate the risk profile of the insured person every hour or every day. The variety aspect of Big Data is also interesting. Organizations can gather unstructured data such as text, voice, and video from non-traditional data sources such as mobile, social media, videos, chat, and sensors. Analyzing the structured data with the data gathered from non-traditional sources enable an organization to make better and informed decisions and thus improve its competitive advantage. The insurance industry faces many challenges in properly integrating the structured and unstructured data. Legacy IT systems, lack of skilled resources, credibility and reliability of big data, and privacy issues are the hurdles the industry has to overcome to harness the full potential of Big Data (Pozzi, 2014). Companies that can overcome these challenges and incorporate Big Data in their decision process will be able to add more value to their customers and other stakeholders. Pozzi, S. (2014). Big Data Big opportunities. Best’s Review, March 2014, p 60. When does an idea become an opportunity? The thought of a new idea can sometimes be so exciting that we tend to initiate the work on the prototype right away. It is very essential to understand that all ideas not necessarily lead into or turn out to be good opportunities. I came across this idea of creating a personal bill management solution (say e-Bill) that provides a platform to effectively manage the bills/statements consumers receive from the providers of utilities, credit cards, banking, mortgages, and other services. Let us evaluate this idea based on the required characteristics of a real business opportunity. Value is created when the benefits to the customer exceed the costs of product or service. The e-Bill idea offers great value to both the bill providers and the consumers. The bill providers are benefited from the cost savings in not printing the paper copies of the bills and statements. For consumers, the e-Bill solution provides a one-stop solution for managing and paying their personal bills and statements. 2. Fix a real problem in the market, something that is truly a market pain. When analyzing at the customer survey I took for this idea, it turns out that about 52% of consumers do not have any concerns. But a promising 33% have some concerns about the existing solutions. 3. The need for the product or service is pervasive, the customer wants urgently to fix it, and the customer is willing to pay to fix it. When looking at the following two responses, about 86% of consumers are interested in a new bill management solution and are ready to give it a try. About 38% of those are willing to pay an annual fee for it. 4. They have robust market, margin, and profitability characteristics that the entrepreneur can prove. In a seven year financial projection, it shows that e-Bill solution attains one million customers in the fourth year of its operation. Also, the startup becomes profitable only in the fifth year. 5. The founders and management team have collective domain experience that matches the opportunity. The two founders have three decades of collective experience in designing and managing software products. In order for an effective execution, the team needs an advisory board with expertise in operations, sales and marketing, and human resources. By applying these characteristics to the e-Bill idea, I have arrived at the conclusion whether it is just an idea or a real opportunity. I will share it in a future blog post. Spinelli, S., & Adams, R. (2012). New Venture Creation: Entrepreneurship for the 21st Century. Business and Economics. What does MBA mean to me? The Commencement ceremony at University of Illinois at Springfield (UIS) on May 17th, 2014 marked the culmination of my pursuit towards an MBA degree. Last two years were extremely busy with a dedication of 40 hours per week for studies in addition to my full time job commitment with the same number of weekly work hours. While relaxing at home this weekend without any stress for meeting an assignment deadline, I started to reflect on what exactly the MBA degree means to me. Am I a different person thinking in terms of the management and finance language? Does it add more value to my current career and search towards a career change? Was it worth the time and money as many potential MBA aspirants concerned about? Unlike a medical or law degree, an MBA does not entitle one to do any specific thing professionally. It will not automatically qualify a person to march towards the executive leadership position. The fourteen courses that I took in five semesters imparted lots of new knowledge that I always wanted to learn about. I chose to do the electives in Entrepreneurship to get a certification in that field. It opened up more avenues in understanding how to capitalize on opportunities and the various stages of starting a company and how differently one needs to think when creating an actual business plan. But an MBA in Entrepreneurship does not guarantee success in my endeavors. Actually one does not need to get an MBA to be a successful entrepreneur or to get on top of the executive ladder. It is an individual’s personal drive and how effectively he/she can utilize the available resources and contacts make the difference. For me the Entrepreneurship concentration provided the tools and confidence to start my own venture and/or to identify the entrepreneurship opportunities within the current job in order to create or add significant value to a customer or end user. Attending the Springfield Angel Investor meet and the Chicago Startup Weekend provided a great practical experience that no textbooks can provide. I attended the UIS Cohort program that enabled a batch of fourteen students to start and finish the MBA together by following a defined set of courses in every semester. It also facilitated more collaboration among the students. The classes were on Friday evenings and on Saturdays at Peoria, Illinois; for certain electives, I needed to attend classes at Springfield or online. Learning from your peers is a true and fulfilling experience. During the class discussions or the course assignments, we had the opportunity to hear the real experiences and problem-solving stories from fellow-students. The quality of your peers can affect the way we understand a concept or like/dislike a course. Our batch was fortunate to have a wide mix of backgrounds that has enhanced our learning experience. Each subject ended with still more readings to be done and discussions to be made. We plan to continue our interactions through a social networking group and through annual get-togethers. Yes, an MBA can make you a different person in terms of your thinking and interactions; but like any motivational speech, the effects will be temporary unless you continue the momentum through your real and sincere efforts. In your current career, an MBA can have positive effects if the employer mandates it for certain positions. Also, the way in which you proactively project yourselves as a change agent in applying the newly acquired knowledge can make a big difference. For the risk takers, sky is the limit if you like to change your career direction or do a career progression by moving to a new employer. You should be prepared to accept a lower salary if your new interest or dream position is different from the current one and you possess minimal or no experience in that. I strongly feel that I did the right decision to spend my time and money on earning an MBA and it will help me grow personally and professionally. It will hold true as long as I can effectively identify the right opportunities and act on it to add more value to all the stakeholders. What do Banks look for in a Commercial Loan Application? I had the opportunity to hear from Mark Vance, SVP of Carrollton Bank, on the review process for the commercial loan applications they receive. Here are the six key factors that Bankers review before approving a commercial loan. These factors are listed in the order of its significance. The clean image of the founders/executives of the applicant company is a key factor in the approval process for a loan. If those executives are introduced to the bank through a strong referral, it will be a great advantage. If the referencing person is already a reputed customer of the Bank, it will have a huge influence on their final approval. Banks look for an excellent credit score for the founders/executives of the company. If you have bad stories from the past, do not try to hide those facts. You can try to be frank and explain the specifics of those situations. Creditors always like to hear how an applicant braved the adverse circumstances in the past and became successful. A company’s cash flow is the net profit plus its non-cash expenses minus the depreciation and amortization. The creditors look for some minimal levels of cash flow as it can be used to pay back the loan. Also, other creditors and employees can be paid on time indicating the stability for the company. There must be enough cash balance needed to handle the losses, if any, during the initial months. The other income of the founders/executives is scrutinized at this stage to assess the loan-repayment capacity. The Bankers want to identify the other assets of the applicant/co-applicants so that it can be easily converted to cash if needed. These include real estate holdings, certificate of deposit, savings accounts, and stock portfolios that can be liquidated faster. Banks may not approve the loan without any collateral. Usually the repayment of the loan can be done if the company has enough cash flow. Otherwise, it can be repaid using the available cash or by using the Net Worth items listed above. All these six factors need not be absolutely perfect for an applicant even though a healthy mix will work out to be ideal. The applicant company should also produce a Business Plan that encompasses these six items. Business Plan should not be an optional document; instead it is a pre-requisite for the loan application. An easy-to-read, visually appealing Business Plan can be a deal-winner. Power by definition is the ability to recognize and realize the potential of whatever position you are in. The Conviction and Connection model of power shows the fine point where the self-oriented (conviction) and the other-oriented (connection) dimensions meet. Conviction is defined as having a clearly defined position and being both willing and able to communicate it. Connection is the ability to listen, empathize, understand, and care about another person’s point of view (Purcell, 2013). There are two extremes for conviction. One extreme is the rigid position in which there is no conflict because ‘I AM RIGHT’. In the other extreme, it is wishy-washy like a wet bar soap. There is no conflict here, but the leader is un-reliable, incompetent and non-trustworthy. For connection, there are two extremes as well. One extreme is the cut-off where the person unplugs, shows attitude and try to avoid others. In the other extreme, the person is too curious about and over-accommodating others that raise eyebrows and suspicion. There can be moments in our work life where we may not have a clearly defined position during the project discussions and incidents where we care more about others’ positions so as not to hurt their feelings. In order to become powerful, or cultivate leadership traits, one needs to move away from these extremes and find the right balance of both conviction and connection. Even when we have a clearly defined position, if we are not willing to effectively communicate that, it will be a clear case of under-conviction. In the similar way, if we do not listen to or clarify others’ positions by taking an indifferent approach, we will not be able to connect with them at all. True leaders always strive to find the right balance between conviction and connection.